Amazon has released the trailer for the upcoming season of Phoebe Waller-Bridge’s Fleabag. The scathing, devastating comedy will return as the title character takes a new journey. Creator and star Waller-Bridge spoke about the new direction she will be taking during the TCAs. Sian Clifford, who plays the title character’s sister, also told The Guardian that this season will be the show’s last. The second season recently concluded on BBC Three, to rave reviews, and will be released globally next month. 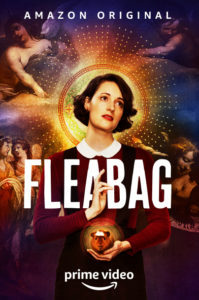 “Fleabag (Phoebe Waller-Bridge) is back for a second bite, and this time she is going toe to toe with the man upstairs. In an unexpected twist of fate, our lost little rascal meets a Priest (Andrew Scott) who jolts her into seeing the world in a different way. Picking up a year on, there are still old wounds to unpick and new ones to dress as the next chapter of Fleabag’s life takes her to hell and back. The second season will see the return of main cast members Waller-Bridge, Sian Clifford, Bill Patterson, Brett Gelman, Jenny Rainsfor, Hugh Dennis, Hugh Skinner, and the wonderfully savage Olivia Colman. Special guest stars include Fiona Shaw and Kristin Scott Thomas. Fleabag season two will be available on Amazon Prime on May 17.